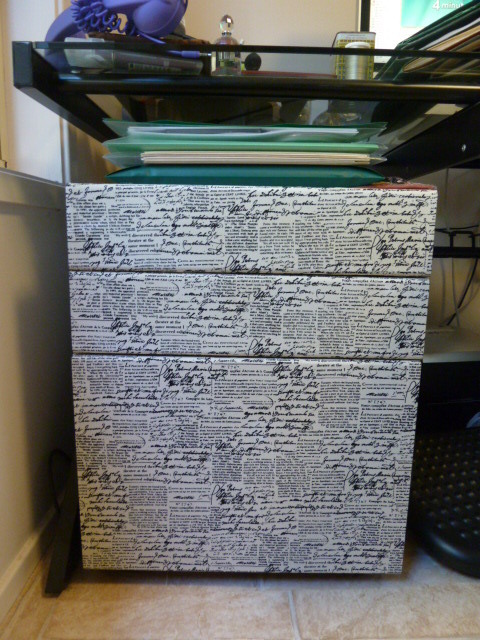 Last time I told you that I was redoing my desk drawers. They are 24 years old and in dire need of a facelift. Here is how they looked before I worked on them. All chipped and tired looking as you can see. There are two sets. The ones I fixed last week had a filing drawer in them and now look like this. The only problem was that I nearly gassed myself using an oil-based polyurethane to finish. Even when it was dry it stank for several days. In fact even now it has a faint chemically pong. It caused me no end of asthma type problems. Anyway, today I went and bought some water-based polyurethane to do the other drawers and that was much less problematic. I’ll show those when they’re dry. If you want to revamp some item of furniture then this is what I did. 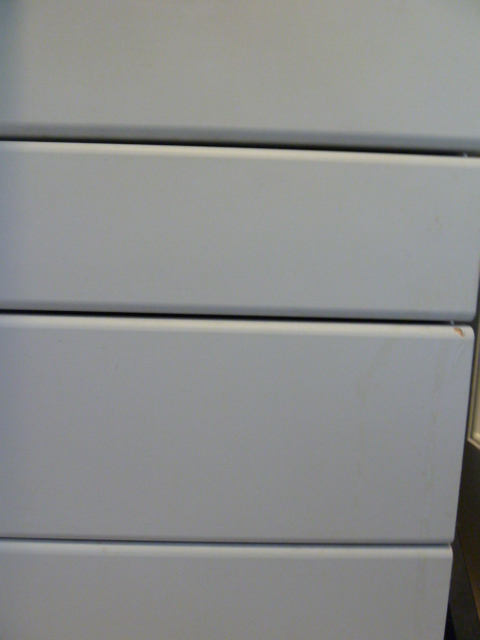 I lightly sanded the drawer fronts and then wiped them down. 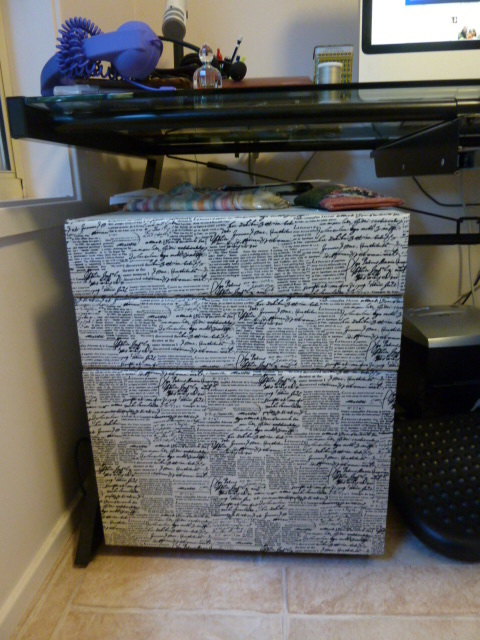 I cut some fabric an inch bigger than the drawer fronts on all sides. I smeared the fronts and the the underside of the lip evenly with PVA glue and then I placed the fabric on the glue. I smoothed out the fabric and made it taut and then I used a staple gun to secure it. Once this was accomplished I painted on the polyurethane and waited for it to dry. It may or may not need another coat. I haven’t really decided yet but for the moment it’s looking fine and is a great improvement on the tatty drawers that were there before. Very nice! I have developed a fondness for text fabric lately, and I like the understated look in black and white. I’ve been meaning to tell you that I like the new header here on the blog. Did you design it yourself? This is such a great idea! I am imagining using some of those cute novelty prints in a child’s room to add the cute factor to their furniture. Thank you so much!